Cathy Woods recaps the most recent “Find Your Inner Cowgirl though Body, Mind, Equine” event at C Lazy U. If you missed it, you can join the next event May 9-12, 2019! WOW! 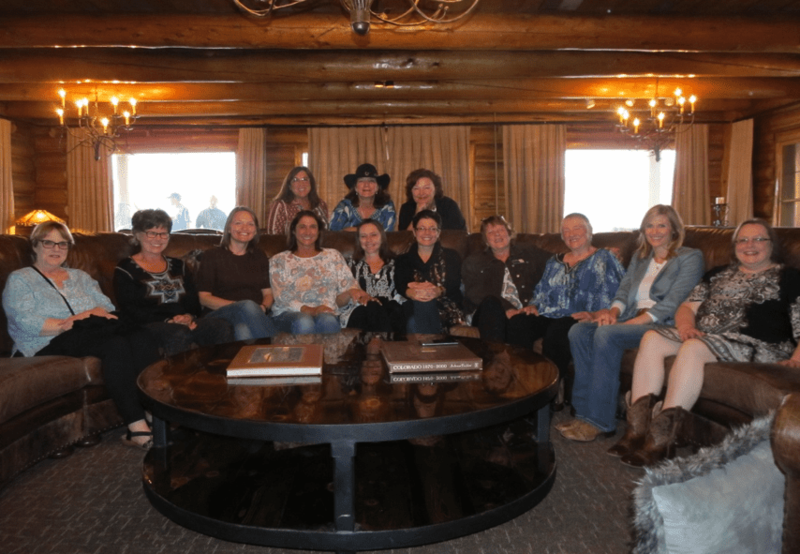 Where to begin recapping the many great moments at the Find Your Inner Cowgirl Retreat, May 2018 at C Lazy U Ranch? This was my second time leading this program here, and it just keeps getting better. I already can’t wait to do it again next year! It began when a group of 11 women — who mostly did not know each other — came together for opening circle, along with me and my assistant Amanda. As retreat leader, I like to set the tone for our time together and create a safe container for women to bond, shine, be themselves and have a powerful experience. They did just that from the get-go. Something special happens when a group of women come together in this way; it is palpable. During the opening mixer, we got to know each other a bit and connections already began to form. The women were all open to connect and discover what commonalities brought them to this place at this time in their lives. From there, the camaraderie continued through our lovely first meal together, expertly prepared by the C Lazy U chefs. Good wine, good food, and laughter melted away any armor or tensions that guests may have had. During dinner the first night, the women (on their own) decided they needed “cowgirl names.” So they came up with fun, fitting names for all — like Maverick, Ms. Kitty, and Doc — which helped us to get to know everyone and revealed a bit about their personalities. I was just memorizing everyone’s real name, so I was now doubly challenged to remember these new ones (he he). The next day, everyone was bright-eyed and bushy-tailed for early morning meditation and yoga, after watching the “daily jingle,” which is where the wranglers bring the horses in from pasture. The herd of 200 come barreling in through a cloud of dust. Big, small, fast, slow, some with tails flagged, some with ears back. The pounding of hoofbeats can be heard in the distance. It is interesting and telling to watch the “horse language” as the herd moves. All of this makes for a great start to the day! After some centering time, and some good stretches for riders, we discussed the parallels of yoga and horsemanship, which is the basis for this program. Some examples include: present moment awareness, breathing and energy awareness, body alignment, balance, etc. These practices can be taken from the yoga mat and into horsemanship, from ground to saddle. As we discover, they can be applied to any area of life! From there, we took our centered, grounded energy into the arena and met our mounts. The wranglers paired up suitable horses with their person. Each guest kept the same horse for the entire retreat. In doing this, progress and growth is clearly visible. By the end of the weekend, the ladies’ interactions and riding had improved dramatically. They built confidence, developed their skills, and showed big smiles rather than nervous grimaces. There were different levels of riders — mostly novices in this group. Some started out a bit stiff and overly cautious. They became confident riders as we progressed, with lower, softer hands, more fluid body movements, and the like. The program slowly builds, increasing proficiency in riding and personal assurance. After a few hours in the arena the gals were comfortable and ready for the afternoon trail ride. The first trail ride was expertly led by Ami, the very competent horse woman, head wrangler and events coordinator at C Lazy U. It was an excellent ride! 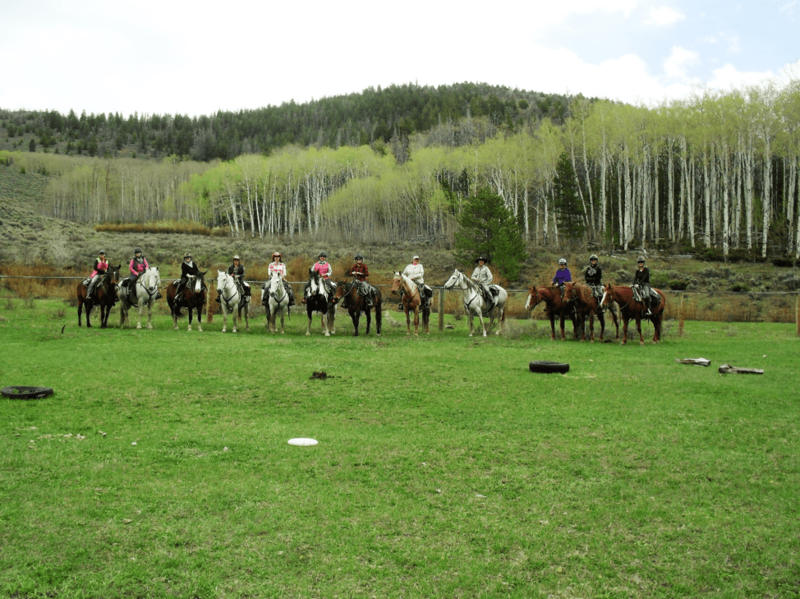 We saw some deer, rode through the beautiful Colorado landscape, and even rode through a logging area where the ladies had to maneuver through obstacles. Everyone did great and it was magical to be out in the fresh air and blue skies of Colorado. By the way, the ranch ordered up perfect weather for us once again. At dinner that night, the ladies were truly beaming and proud of themselves for gracefully navigating a full and challenging day. One of my favorite things about leading retreat is seeing tensions melt and confidence soar. We each shared our personal highlights and achievements of the day. The next day added some elements in the arena and upped their riding skills. They rode in a serpentine pattern, having to rein their horses back and forth to follow the leader. We “danced” with our horses to music, from slow and mystical… to jazzy… to upbeat, transforming the energy and mood of the riders and horses. This day, our trail ride included a picnic lunch. The ranch packed hearty lunches and snacks which we put into our saddle bags. Ami and the other female wranglers took us to a beautiful spot, where the horse grazed and so did we. Again, more sharing, relaxing in nature and being ourselves. By now the women were riding like old pros, chatting, maneuvering their horses, and relaxing in their saddles. A joy to watch! One of the important messages of this retreat is to be authentic, to be who you are, and embrace the true meaning of Namaste: honoring each other’s inner light. There is no judgment at this retreat. The women support each other. They share the stories of their lives, make heart connections, shed happy — and sometime sad — tears as they move through blocks in their lives. The magic of retreat takes on a life of its own. Each person experiences just what they need to. I set the intentions on opening night, to “drop any expectations,” to create space and allow the experience to be as it is without attachment to how they think it should be. Often, the women think they are just coming to do yoga and ride horses, but the experience can morph into something else entirely. My hope is that everyone goes home relaxed, renewed, and yet empowered, with new skills to incorporate into daily living. The final morning we met for closing session, which is one of the most powerful moments of the program. We invited Ami and some of the wranglers to join us. Each person had the chance to share (if they felt inclined) about their journey. The comments, the smiles, and the joy just filled each heart in the room, as the reviews below attest to. We awarded first-place ribbons to each participant for categories like best cowgirl spirit, most natural rider, and best smile. We finished with a slide show presentation from photos taken through the retreat of the ladies “owning their cowgirl spirit!”If this type of experience speaks to you, consider joining in May, 2019. Bring your best girlfriend, mother or daughter, or come solo. Whichever way, you’ll have a great time and a unique experience. Truly, this is my favorite retreat to lead and I’m planning to add a few new surprise elements next year! You can view photo album from the 2018 event on Facebook here. 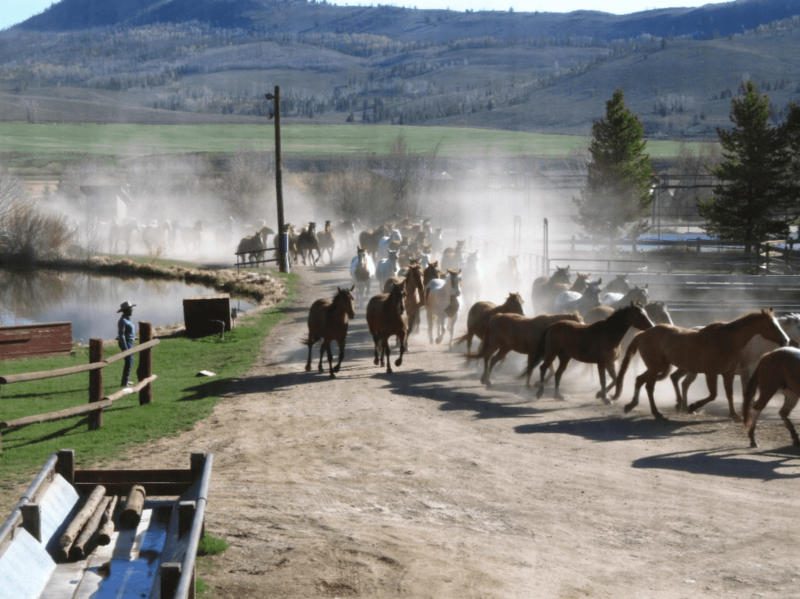 Find Your Inner Cowgirl through Body, Mind, Equine” is the ultimate retreat if you are looking for an experience that underscores the meaning of positive self-care. As a Licensed Clinical Psychologist, I own and operate a small mental health practice. It is essential for me to take care of myself so I can help others through their own healing process. I have attended this retreat twice and I am attending again in 2019. My experiences with this retreat have truly been transformative. Everything about this experience is amazing. C Lazy U ranch is the perfect venue. The staff are accommodating and a real pleasure to interact with. The meals are delicious and you will never go hungry. The daily jingles are wonderful. There are no words to express the magnificence of remaining present as hundreds of horses thunder to and from pasture. I would describe the other women who attend this retreat as strong and soulfully beautiful. I immediately felt bonded to them and it was incredible to experience the safety and acceptance every woman openly and willingly shared with one another. I believe all this was impeccably planned by two devoted women: Cathy Woods and her dedicated assistant, Amanda. Together, these women exemplify the meaning of “Namaste.” So, if you are looking for peace and tranquility by the way of the cowgirl, your journey will not be complete until you embrace your inner strength through love and self-compassion. I look forward to meeting all of you in 2019. Horses and yoga??? YES!! 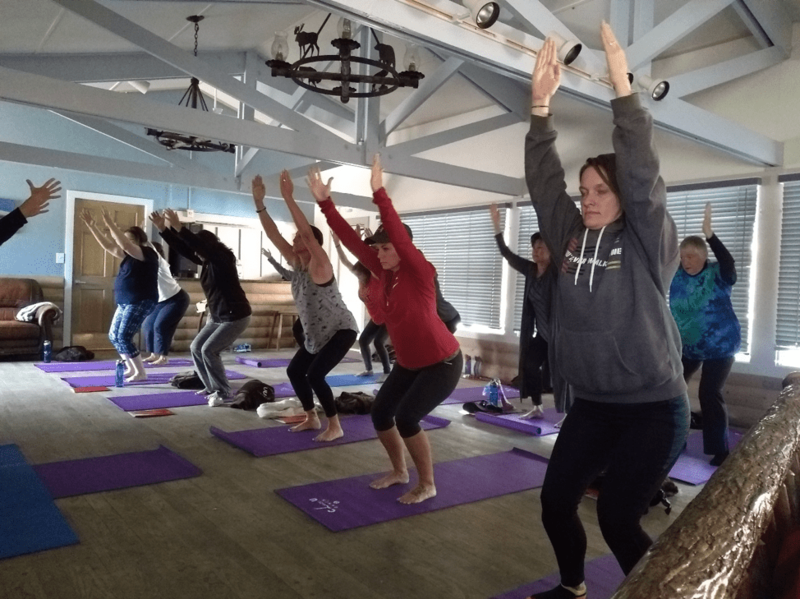 I recently had the opportunity to participate in Cathy Woods’ Equestrian Yoga Retreat at C Lazy U Ranch. Since I neither ride or do yoga, my concerns were immediately put to rest! Cathy expertly and patiently worked with our group, taking into account the level of each individual participant. The weekend was perfectly planned and Cathy is an exceptional leader. The ranch was magnificent and the experience enlightening! I highly recommend a weekend retreat with Cathy! It will change your life! 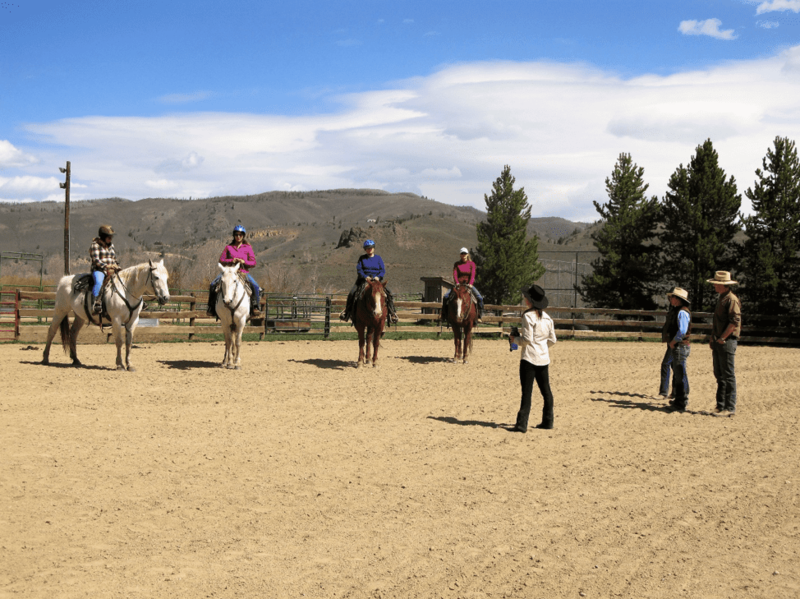 The find your Inner Cowgirl through body, mind equine workshop at the beautiful C Lazy U Ranch in Granby Colorado was a joyful experience full of glorious surprises, including the beauty and grandeur of 200 horses against the backdrop of the Rocky Mountains. One might think that participants be well versed in both yoga and horsemanship or at least one or the other. Yet, it seemed that those who attended embodied simply joy surrounding a yoga experience that included a 3-day assignment with a mentor horse. There were many revelations through the weekend accompanied by good food, friendship, leisure time and a phenomenal body tune-up with yoga practice and on horseback. Long post ride soaks in the tub were enjoyed by many. Cathy Woods is a passionate experienced yogini and horsewoman who, along with her assistant Amanda, turned the weekend into magic. C Lazy U Ranch has got the mojo with hosting this kind of group and it was beautiful to see how they loved us and the work that they do on the ranch. If you feel called to participate, you will not be disappointed.